Whether you are moving, heading on vacation or going on an extended business trip, you’ll occasionally find it necessary to travel with your dog. And while this is pretty simple for those driving from point A to point B, it is a rather complicated endeavor for those who intend to fly. There are a number of steps you’ll need to take and preparations you’ll need to make before flying with your dog – especially if you have a large dog. We’ll explain the basics of flying with large dogs below and give you a few helpful tips for making your journey as smooth as possible. Before we start digging into the details of flying with large dogs, let’s talk about the basics. You’ll have to start planning early when deciding to travel with your pet. You may need to purchase a crate, you’ll need to visit the vet and you must contact the airline at least two weeks prior to your scheduled departure (and it’s wise to do so a month or more in advance whenever possible). They can travel as carry-on luggage, and ride with you in the cabin. This is generally only permitted for very small dogs or those who perform services or provide emotional support for disabled passengers. They can fly as checked baggage. This will require you to check your dog’s crate just like you would your baggage, and it means you’ll pick him up via the same baggage conveyor carrying the rest of the checked baggage from the flight. They can fly as cargo. This is always necessary if you aren’t traveling with your pet, and some airlines will require that all large dogs fly in this manner. Don’t worry – your pet will end up in the same place that checked baggage does. You’ll just have to check him in and pick him up in a different facility. As the weight limit for cabin travel is typically 20 pounds (including carrier), most Canine Weekly readers will be forced to choose between checking their dog as baggage or having their pet fly as cargo. And while there are pros and cons to each approach, some industry experts advise that you should always have your dog fly as cargo, as it allows them to be tracked independently of your ticket. Most airlines require pets to be at least 8 weeks old and completely weaned before flying. You’ll also need to take your dog to the vet within 10 days of departure to obtain a certificate of health. This will need to state that your dog is flea, tick and free of contagious diseases (they want to ensure your dog doesn’t have rabies, parvo or some other communicable disease – they don’t care if your dog has hip dysplasia or arthritis). Many airlines will not allow dogs to travel in the cargo hold when the temperatures are below 45F or above 85F. So, you’ll have to schedule your travel when such temperatures are unlikely. Additionally, some airlines have breed-specific restrictions. These tend to be directed at brachycephalic (short-nosed) breeds, such as pugs and bulldogs. These dogs often have difficulty breathing and don’t adapt well to temperature extremes, which can cause them problems while flying. Can You Fly with Large Dogs? 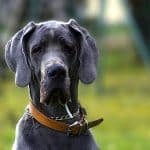 You can usually fly with large dogs, although most airlines will make you check them as baggage or cargo (many airlines have a 75-pound limit on dogs checked as baggage – if your dog exceeds this weight, he’ll need to fly as cargo). However, large dogs who provide services or emotional support for disabled passengers are sometimes allowed to ride in the cabin. Different airlines have different regulations regarding dog size, so you’ll just have to contact the airline and ask. Note that most size regulations relate to the length and width of the crate your dog will require, rather than your dog’s body weight. How Much Does It Cost to Fly with a Large Dog? Most airlines charge about $125 (each way) for pets who ride in the cabin, but the prices associated with checking your dog as cargo vary wildly. You should probably expect to pay at least $200 each way, and you may occasionally find that the one-way costs exceed $1000 for your pet. Which Airline Is the Most Pet-Friendly? Simply put, some airlines make it easier and more comfortable for pets and their owners than others do. And while picking the best ones is obviously a subjective process, a few consistently rise to the tops of most such lists. You can usually travel internationally with your dog, but you’ll have to jump through a number of additional hoops to do so. Most overseas destinations (including all of Europe) will require that you obtain a Department of Agriculture stamp before allowing your pet to enter the country. You’ll have to pay for such a stamp, and you may have to pay for other certifications and fees, depending on the destination country. Always be sure that you investigate the specific requirements of your destination country before planning your trip. If your dog doesn’t meet all of the requirements, local officials may quarantine your pet or send him back home. In some cases, they may even be legally required to euthanize your dog. Also note that you’ll often need to pass through customs before you’ll be allowed to let your dog out of the crate, so he can go to the bathroom. There’s not much you can do about this, but definitely factor this time into your overall plans. Be sure to discuss your travel plans with your vet before leaving. Some locations may present specific health risks to your pet, including pests or disease. What Type of Crate Does Your Large Dog Need to Fly? You can’t simply use any old crate when flying with your dog – you’ll need an airline approved large dog travel crate that provides him with the protection and comfort he deserves. You’ll usually need to use a crate that complies with the International Air Transport Association’s (IATA) guidelines. The kennel must be made from fiberglass, metal, rigid plastic, welded metal mesh, solid wood or plywood. In practice, most airline-friendly crates available commercially are made from a combination of rigid plastic and welded metal mesh. Length – Take the length of your dog’s body (nose to tail base) and add it to half of the length of his front legs. In other words, if your dog’s body is 40 inches long and his front legs are 16 inches long, his crate must be 48 inches long. Width – The crate must be at least twice your dog’s shoulder-to-shoulder width. Height – The crate must be as tall as your dog is while standing. Note that short-nosed breeds require crates that exceed these guidelines by 10%. The travel crate door must take up one whole side of the crate, it must be made from welded metal mesh, and lock securely. The crate must be held together by metal hardware. This is very important to note, as many commercially produced flying crates come with plastic hardware, which you’ll need to replace. A green or red “Live Animals” tag or sticker must be placed on the crate, and “This Side Up” (arrowed) stickers are required as well. There are a few other minor guidelines the IATA recommends (you can read the full requirement list here), but most commercially sold crates meet them. A number of different crates on the market that will work well for flying with your dog, but Petmate makes two of the best. We’ll discuss the features of both crates for air travel and compare the two below. About: The Sky Kennel is a heavy-duty, US-made large dog travel crate that will help keep your pet safe and comfortable for the duration of his journey. All four sides provide your pet with great ventilation and allow him to see what’s going on outside the crate. The four-way, vault-style door is made from sturdy metal wire and features a secure, yet easy-to-operate latch to ensure your dog can’t escape from the crate. The Sky Kennel comes with two “Live Animal” stickers, pet ID stickers and the type of clip-on food and water dishes that most airlines require. The Sky Kennel is also environmentally friendly (it’s made from recycled plastic), which is an important bonus for some owners. Unfortunately, the Sky Kennel does come with plastic screws and wingnuts, which you’ll need to replace with metal hardware. However, this is a very minor problem, which won’t cost you very much to fix. Five minutes and $5 should solve the issue. User Reviews: Most owners were pleased with the Petmate Sky Kennel – 72% of which rated the crate as a 4- or 5-star product. The crate appears to work as advertised, although a significant percentage of owners reported sizing problems. To avoid these, err on the large side when choosing the best one for your pet. The majority of the complaints about Petmate Sky Kennels related to one-off manufacturing or shipping problems. Bottom Line: We wish Petmate would use metal, rather than plastic hardware for these crates, but as mentioned earlier, this is a relatively simple problem to resolve. Aside from that, the Sky Kennel appears to work well for airline travel, it is available in sizes large enough for big dogs, and it comes with many of the extras (such as food and water bowls) that you’ll need. About: The Ultra Vari Kennel is one of the best large travel crates available for flying with your pet. It satisfies virtually every criterion most airlines impose on owners, and it comes with several “extras” that you and your pet will appreciate. The airline approved crate is made from heavy-duty plastic, comes with a handy carrying handle, and provides four-sided ventilation. This will help keep your dog comfortable and allow him to see outside the crate. It also comes with metal hardware and tie-down holes for securing the door shut before takeoff. The squeeze-latch door is very secure, while still being easy to open and close. Additionally, the Ultra Vari Kennel features a floor moat, which will keep your pet drier if he has an accident or spills his water dish. It’s also available in two different colors: Bleached Linen and True Blue. User Reviews: Most owners who tried the Petmate Ultra Vari Kennel were very happy with their purchase. Seventy-six percent of the owners who tried the kennel rated it as a 4- or 5-star product and most characterized it as sturdy, dependable and easy to use. Most of the complaints related to shipping or packaging problems. Bottom Line: If you want the best possible airline crate for your dog, and you don’t mind paying for it, it’s hard to go wrong with the Ultra Vari Kennel. It satisfies almost every airline requirement and is built like a tank. You will need to purchase “Live Animal” stickers and clip-on dishes separately, but that’s a relatively minor shortcoming for an otherwise excellent crate. The Ultra Vari Kennel is a rather pricey item, but it’s hard to put a price on your dog’s safety and well-being. Special Note: The Ultra Vari Kennel doesn’t come with the required “Live Animal” stickers or clip-on water and food dishes. However, these things are easy to acquire by simply purchasing the Dry Fur Kennel Travel Kit for Pets. This US-made kit includes everything you’ll need to make your Ultra Vari Kennel ready for your pet’s flight. This includes one double-diner dish with separate compartments for food and water, one shipper’s declaration form label, one plain live animal label and two live animal labels with arrows. Most owners found that the Kennel Travel Kit made flying with their pet easy and hassle-free, and several noted that the kit is priced very affordably too. Can You Give Your Dog Something to Keep Him Calm While Flying? Some dogs tend to get a bit anxious when traveling, which leads many owners to wonder if it may be wise to give their pet a sedative before traveling. But this is a bad idea, that is discouraged by both the U.S. Humane Society and the American Veterinary Medical Association. Some dogs can have bad reactions to sedatives, and it often makes it a bit difficult for dogs to breathe – hardly an ideal situation for dogs stuck in the cargo hold of a plane. Additionally, many sedatives will lower your dog’s blood pressure, which already happens at high altitudes. This can create a potentially dangerous situation. Also, your pet will be unattended and inaccessible during the flight. If something were to go wrong, there’d be no way to assist your dog – you wouldn’t even know there was a problem until you arrived at your destination. Therefore, the best thing to do is to help your dog get used to his crate. Be sure to introduce your dog to the travel carrier slowly (particularly if your dog isn’t accustomed to using a crate) and offer him plenty of treats when he goes inside voluntarily. This will help establish a positive association with the crate. It’s also a good idea to get him used to the feeling of being transported while inside the crate. So, have your dog crawl into the crate, and then load the crate in your car. Drive around for a while with the windows down and the radio on, so he can get used to the loud sounds and wind sounds he’ll experience while making the journey. What About Service and Emotional Support Dogs? Most large dogs will be required to fly in a crate placed in the plane’s cargo hold, but there are a few exceptions. Service dogs and emotional support dogs are usually allowed to accompany their owner in the cabin. True service dogs (such as guide dogs used by the blind, or dogs that are trained to monitor their owner’s health) are almost always permitted to ride in the cabin, as they’re covered by the Americans with Disabilities Act. Emotional support dogs aren’t covered by the ADA, but most airlines still allow them to ride with their owners. In either case, some airlines may impose weight, size or breed restrictions, so be sure to call the airline and ask about their policies before trying to travel with your service or emotional support dog. If you purchase a high-quality, IATA-compliant crate, prepare your dog for the journey and follow the airline’s rules and regulations for flying with your pet, you and your pet will likely find the trip proceeds in problem-free fashion. While most planes have climate-controlled, pressurized cargo holds, these systems must often be activated manually by the pilot. And while most pilots are conscientious about the pets in their care, mistakes occasionally happen, which could expose your dog to dangers. One of the best ways to avoid these problems is by writing a short note to the captain, explaining that your dog is riding in the cargo hold and you just want to ensure he is comfortable. 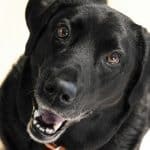 Most captains will go out of their way to reassure you personally or have their staff speak with you and verify that your dog’s well-being is at the front of their mind. 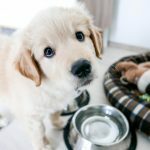 You don’t want your pet getting hungry during your travels, and because you may be unable to feed him for several hours after arriving at your destination, it is usually wise to feed him within four hours of takeoff. Some airlines will even require that you do so. Most dogs can go at least 6 hours between bathroom breaks, (and some can go much longer than this) but you’ll always want to give your pet the chance to go to the bathroom before putting him in the crate. This is especially important for dogs going on long flights, as they’ll also drink water while traveling. Some high-end travel crates have special features that’ll help keep your dog comfortable in the event of an accident. This can help ensure that your dog doesn’t have to lay on a wet crate floor during the flight. It may be a good idea to give your dog the chance to enjoy some moderate exercise before going on the flight. This will help ensure he’s happy and feels his best before the flight, and it’ll likely cause him to sleep for most of the trip. This can help keep his stress level low – before he knows it, he’ll be getting off the plane and rejoining you on the ground. Hopefully, your dog will spend most of the flight sleeping, but you’ll want him to have a familiar chew toy with him in case he becomes anxious. Just be sure that the chew toy is durable enough to be left with your dog without supervision. If the flight is longer than three hours, it is often wise to freeze a portion of your dog’s water. This will ensure that he’ll have water for the duration of the flight and won’t be able to drink it all in the first 15 minutes. Don’t freeze all of the water – just fill dish 1/3 to ½ way, freeze it overnight, and then add water on top right before you put your pet inside. You may not always have the option of traveling during off-peak times, but it is usually worth tweaking your schedule slightly to avoid travel-heavy days or weeks. 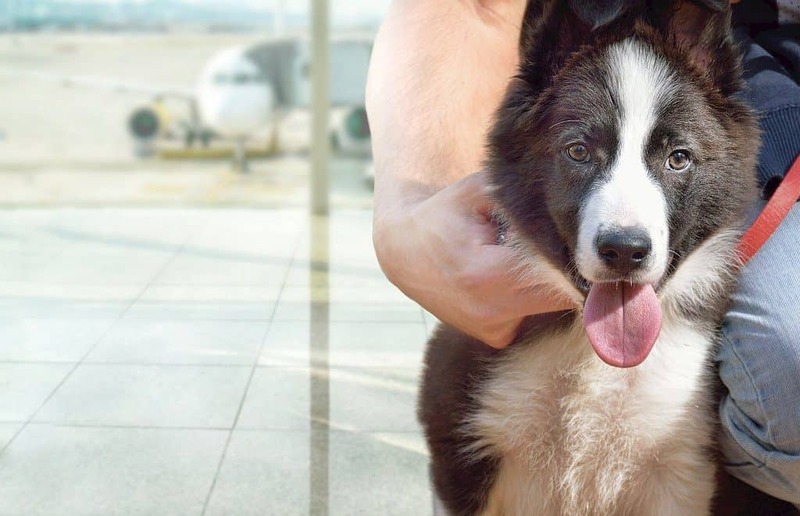 This will simply make it easier to navigate the airport with your pet, and the flight staff will usually have more time and energy to devote to you and your pet. Unless your dog rides in the cabin with you, you’ll have to hand your beloved pet over to strangers when getting ready to board your flight. And although it doesn’t happen very often, dogs are occasionally lost by airlines. Sometimes dogs are put on the wrong plane; others are not transferred to the appropriate connecting flight. Lost dogs are almost always found, but it can take a long time for the airline to track your pet down. 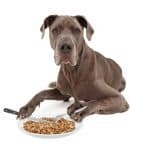 This is sure to be stressful to you, but your poor pet is likely to suffer even more – he won’t understand what is happening, why he is in such a strange place, nor why his owner isn’t around. Always make sure your dog has a collar and ID tags. All dogs should wear ID tags at all times, but it is especially important when you are traveling with your pet. Have your vet insert a microchip implant in your dog. Microchip implants are very small devices (about the size of a grain of rice), which are inserted underneath your dog’s skin. Once you register your dog with the chip manufacturer, it’ll be easy for a vet, animal control officer or anyone with a chip reader to help identify your dog and reunite him with you. 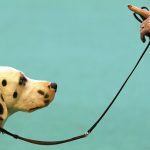 Fit your dog with a GPS tracking collar. A GPS tracking collar will allow you to see exactly where your dog is, no matter where the airline has accidentally shipped him. GPS tracking collars usually display your dog’s position on your smartphone, tablet, laptop or desktop computer. Carry a photo of your dog with you. By sharing a photo of your dog with the airline staff, they may have an easier time finding him and reuniting the two of you. Make sure that your phone number or email address is on the outside of your dog’s crate. This should make it easy for the airline staff to find you if all else fails. Try to schedule flights during the week. If the airline misplaces your pet, you’ll surely find that it is easier to locate your pet during the week, when most of the staff (including the corporate staff) is on duty, rather than on a weekend, when some employees will be off or difficult to reach. Again, these types of problems are relatively rare for modern travelers and their pets, but it is always better to be safe than sorry. Flying with a large dog can be a bit of a headache, but if you familiarize yourself with the basic rules, procedures, and norms discussed above, you’ll know what to expect and be better prepared for the ordeal. Just try to embrace the tips (and consider purchasing the products) discussed above to make everything go as smoothly as possible.